I have recently been testing out the YESto skincare line, after I saw their Lip Butter in the store (I had needed something for my lips because they were cracked, sore, and dry nothing had been helping) I decided to purchase one lip butter and give it a go to see if would help. After trying the YESto Carrots Lip Butter I am totally in love with it, nothing I've tried before this has been able to hydrate my lips or keep them as soft as this stuff. Even after this stuff wore off my lips were still really soft and moisturized enough to the point where I could again wear lipstick without it looking terrible. A few weeks ago I was contacted by a PR from YESto Carrots on Twitter and offered a chance to try out some of the other products so of course I jumped at the chance since I was also wanting to buy the skincare stuff but was on a tight budget from being off work. Not that they are expensive! The pricing is extremely reasonable compared to higher end brands. Note: I have dry sensitive skin with a lot of red around my nose and cheek area. 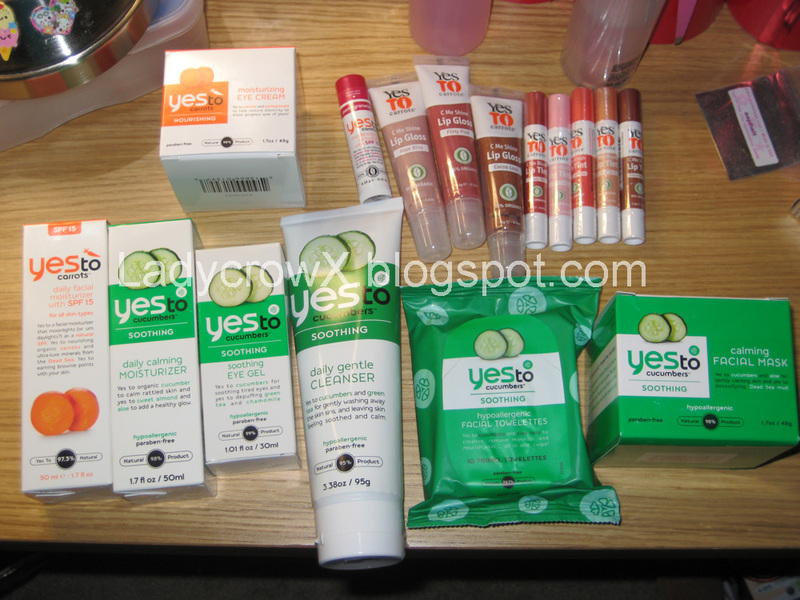 I started every morning by washing my face with their YESto Cucumbers Soothing Daily Gentle Cleanser, followed by YESto Cucumbers Soothing Eye Gel, YESto Carrots Daily Facial Moisturizer with SPF15, YESto Carrots Moisturizing Eye Cream, and to finish I applied YESto Carrots Lip Butter. 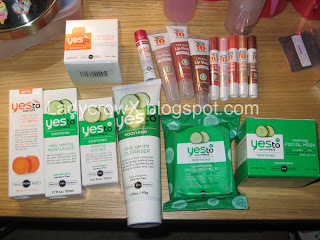 In the evening I would use the YESto Cucumbers Soothing Daily Gentle Cleaners, (2-3 times a week YESto Cucumbers Calming Facial Mask), YESto Cucumbers Soothing Daily Moisturizer, YESto Carrots Moisturizing Eye Cream, and YESto Carrots Lip Butter. They also sent me another Lip Butter in Pomegranate, 3 Lip Glosses, 5 Lip Tints, and a package of YESto Cucumber Hypoallergenic Facial Towelettes. Is the Pricing Good? YES, the pricing ranges anywhere from $2.99 to $19.99 per item. Another good thing about YESto is that a lot of the ingredients are natural which is always a plus especially for sensitive skin. Here is a link to their website ingredients page. They have the following categories you can choose from (or mix them up like I do). Found in the FAQ page of their site: "Yes To is a cruelty-free company and we NEVER test on animals. We love the little creatures!Something we are very proud of is the PETA2 endorsement of our hair and skin care products"
I will be adding in swatches of the Lip Tints and Lip Glosses shortly, so be sure to check back if you'd like to see them. What a unique name 'Yesto Carrots' haha...never heard of the "Yes to" brand before.. I really like everything I've used from Yes to Carrots! Here in Canada we are just starting to get the full line so I'm excited to try some more (including the Yes to Cucumbers line!) Great review! Thanks so much! I think you've sold me on this. I also have really dry sensitive skin that's prone to breakouts and nothingggg works. I think I'm going to try this, I always appreciate natural ingredients because my skin really hates chemicals. Girl, I didn't know you were in your 30's I swear I thought you were my age! Thanks for the review! I have been wanting to try this line, but haven't taken the plunge for some reason. Ooooh, they sent you quite a nice selection! Great review - I've been eyeballing these goodies for a while but haven't brought myself to actually buy anything cos I just wasnt 100% sure they'd be any good. aww, that's very lucky! we don't have any of these products over where i live and such a shame as they are such an affordable price. great review.